Events in Khojalu (NKR) and near Agdam (Azerbaijan) on February 25-27, 1992. In 1991 and early 1992, Azerbaijan used an Azeri inhabited village of Khojaly in Nagorno Karabakh as a launching pad for indiscriminate artillery and rocket fire on Stepanakert, the capital of the Nagorno Karabakh Republic (NKR), located only a short 15-minute drive from Khojaly. By the end of February 1992, intensive fire from Khojaly and other Azeri military strongholds in Karabakh had killed 243 people, including 14 children and 37 women, and wounded 491, including 53 children and 70 women. In addition, systematic and intense artillery and rocket fire against civilian targets in Stepanakert paralyzed the city, destroying hospitals, administrative buildings, schools, and homes. By controlling Khojaly, Azerbaijan also prohibited access to Karabakh’s airport, the only link with the outside world, which was used to bring food and medical aid. Furthermore, Khojaly was also used as a staging area for military offensives on Stepanakert and nearby Armenian-populated villages. Thus, Khojaly became a legitimate military target for Self-Defense Forces of the Nagorno Karabakh Republic. In early January 1992, Nagorno Karabakh authorities decided to neutralize this military target and informed the Azeris. The NKR authorities also transmitted this information by radio, TV, loudspeakers, leaflets and other methods to warn the Khojaly civilian population of the upcoming operation, giving the civilian population an opportunity to exit the area through a safe corridor. Azerbaijan’s leadership in Baku, as well as local authorities, and military commanders in Khojaly knew about the corridor, its width and direction. Both Azerbaijani President Ayaz Mutalibov and Khojaly Mayor Elman Mamedov in their 1992 interviews confirmed this fact. 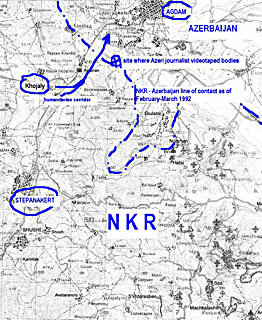 During two weeks leading to the Khojaly operation, NKR Self-Defense Forces observed a mass exodus of the civilian population from Khojaly through the provided corridor (see on the map). The operation to neutralize Khojaly base of the Azeri armed forces began at 11:00 PM on February 25 and was successfully completed within five hours. Nagorno Karabakh forces took full control of the area, killing dozens of military personnel during the operation. Unfortunately, 11 civilians became unintended victims. About 700 civilians and military surrendered to NKR Self-Defense Forces. The captured civilians were returned to Azerbaijan in the following days, while the military personnel was later exchange for the Armenian military prisoners and civilian hostages held by Azerbaijan. When the military operation began in Khojaly, a large group of civilians and armed military personnel from Khojaly used the provided humanitarian corridor to exit the battlefield and began moving in the direction of the Azeri- controlled Agdam. Near Nakhichevanik village of Karabakh (outside of the provided corridor), the group provoked a gun battle with the defenders of Nakhichevanik, which resulted in numerous death on both sides. On February 28 and early March 1992, in the area then fully controlled by Azerbaijan, Azerbaijani and Turkish journalists videotaped images of the hundreds of killed and, during the second video shooting session, also mutilated bodies. Since then, official Baku has falsified the events and used the human tragedy to persistently fan anti-Armenian hysteria to demonize the Armenian people in the eyes of the Azeris and the international community. It used the images to incite anti-Armenian sentiment and intolerance, which resulted in murders and calls from Azeris to wipe out Armenians as an ethnic group. Responsibility for the tragic loss of civilian life on February 26-27, 1992 on the outskirts of Agdam, territory fully controlled by Azeri forces, lies with the political and military leadership of Azerbaijan. First, the Azeri leadership used the territory of Khojaly for indiscriminate artillery attacks on civilian targets, thus turning the town into a legitimate military target for NKR Self-Defense Forces. Second, the Azeri leadership intentionally prevented the civilian population from leaving the militarized village. Third, the Azeri leadership failed to safely relocate civilians from Khojaly after public warnings of upcoming military operation, although it had many opportunities to do so. Fourth, retreating Azeri forces provoked an exchange of fire with NKR Self-Defense Forces some five miles from Khojaly, which resulted in losses on both sides. Fifth, those who had continued, full access to the site of reported close-range, mass killing are responsible for it. The reported killing of hundreds of civilians with incidences of barbaric mutilation of bodies took place near Agdam (some seven miles from Khojaly), on the territory controlled by Azeri forces. Free access to the site by Azeri and Turkish journalists is clear evidence to that end. In addition, Azerbaijan continues to create ground for a prolonged human tragedy by inciting anti-Armenian sentiments and intolerance in Azeri society. Such a policy stalls efforts to build bridges between Armenian and Azeri people and achieve eventual, long-lasting peace between Azerbaijan and Nagorno Karabakh. Background data, journalistic investigation and academic research materials to support the above information are available at the NKR Office and can be provided on-demand. In the course of discussing the issue "On Violation of Human Rights and Main Freedoms throughout the World" at the fifty-seventh session of the UN Commission on Human Rights, the Armenian delegation submitted to the Chairman of the UN Commission on Human Rights information on the real events of February 1992, which was spread as an official document of the fifty-seventh session of the aforementioned Commission. The text of the document is given below. The real reasons are most convincingly reflected in the accounts of Azerbaijanis themselves - as participants in and eyewitnesses of what happened - as well as of those who know the whole inside story of the events in Baku. Knocking out the weapon emplacements in Khojaly and freeing the airport were the only way for the inhabitants of the Nagorno Karabakh Republic to ensure the physical survival of a population condemned by Azerbaijan to complete annihilation. The daily shelling of Stepanakert from nearby Khojaly took the lives of peaceful inhabitants - women, children and old people. Former President of Azerbaijan, Ayaz Mutalibov, has emphasized that "
the assault on Khojaly was not a surprise attack"2. In a "Nezavisimaya gazeta" newspaper interview he stated that "a corridor was kept open by the Armenians for people to leave"3. However, a column of civilians was fired on by armed units of the Popular Front of Azerbaijan on the approaches to the Agdam district border, a fact later confirmed by Ayaz Mutalibov, who linked this criminal act to attempts by the opposition to remove him from power, and blamed it entirely for what happened. In his recent interview with the "Novoye vremya" magazine, Mutalibov confirms his statement of nine year ago: "The shooting of the Khojaly residents was obviously organized by someone to take control in Azerbaijan"4. There is, moreover, the conclusion of Azerbaijani journalist Arif Yunusov, which differs somewhat from the previous statements: "The town and its inhabitants were deliberately sacrificed for a political purpose - to prevent the Popular Front of Azerbaijan from coming to power"5. In this case, though, the Azerbaijanis themselves are named as the perpetrators of the tragedy. What resulted from the betrayal of the inhabitants of Khojaly by their own highly placed compatriots is well known. Azerbaijani propaganda has railed to the whole world about the "atrocities of the Armenians", supplying television stations with horrendous pictures of a field strewn with mutilated bodies. Khojaly is claimed to have been the "Armenians' revenge for Sumgait". Tamerlan Karayev, at one time Chairman of the Supreme Council of the Azerbaijan Republic, bears witness: "The tragedy was committed by the authorities of Azerbaijan", and specifically by "someone highly placed"6. The Czech journalist Jana Mazalova, who by an oversight of the Azerbaijanis was included in both of the groups of press representatives to be shown the "bodies mutilated by the Armenians", noted a substantial difference in the two cases. When she went to the scene immediately after the events, Mazalova did not see any traces of barbarous treatment of the bodies. Yet a couple of days later the journalists were shown disfigured bodies already "prepared" for pictures. Who killed the peaceful inhabitants of Khojaly and then mutilated their bodies, if the tragedy occurred not in a village taken by Armenians or on the route of the humanitarian corridor, but on the approaches to the town of Agdam - on territory fully controlled by the Popular Front of Azerbaijan? The independent Azerbaijani cameraman Chingiz Mustafayev, who took pictures on 28 February and 2 March 1992, had doubts about the official Azerbaijani version and began his own inquiry. The journalist's very first report to the Moscow news agency "D-press" on the possible complicity of the Azerbaijani side in the crimes cost Mustafayev his life: he was killed nor far from Agdam, under circumstances that are still unexplained. The current President of Azerbaijan, Heydar Aliyev, himself recognized that Azetbaijan's "former leadership was also guilty" of events in Khojaly. Already in April 1992, according to the agency Bilik-Dunyasy, he had commented as follows: "The bloodshed will be to our advantage. We should not interfere in the course of events". To whose "advantage" was the bloodshed is clear to everyone. "Megapolis-Express" wrote: "It cannot be denied that if the Popular Front of Azerbaijan actually set far-reaching objectives, they have been achieved. Mutalibov has been compromised and overthrown, public opinion worldwide has been shaken, and the Azerbaijanis and their Turkish brethren have believed in the so-called "genocide of the Azerbaijani people in Khojaly"7. One other tragic detail. It has become clear since the events that 47 Armenian hostages were already being held on 26 February in "peaceful" Khojaly, a fact that the Azerbaijani mass media "covering" the tragedy have failed to mention. After the liberation of Khojaly only 13 hostages (including 6 woman and 1 child) were found there, the other 34 having been taken away by the Azerbaijanis to an unknown location. The only thing known about them is that they were led from the village on the night of the operation, but never reached Agdam. There is still no information concerning what eventually happened to them or confirming that they continued to be held captive by the Azerbaijanis. Obviously, those who wanted to create the impression that bodies had been mutilated by the Armenians first of all disfigured the bodies of those same Armenian hostages, in order to make it impossible to identify them. Precisely for that purpose the outer clothing was removed from many of the bodies and precisely for that reason the bodies of the unfortunate victims were damaged so badly that they became unrecognizable. In the light of the above facts it may confidently be said that the killing of peaceful inhabitants of the village of Khojaly and of the Armenian hostages being held there was the work of the Azerbaijani side, which committed this crime against its own people in the name of political intrigues and the struggle for power.